A fun part of my childhood was catching grasshoppers and dragonflies in a field near my house. I always had to find creative and stealthy methods to catch these creatures, and now I can learn how they are able to transport themselves. Grasshoppers not only have strong legs for jumping, but they also can fly! This is how locusts-migrating grasshoppers- travel for such long distances. Desert locusts even have the fastest reliably meausured insect flight time at 33 km per hour. 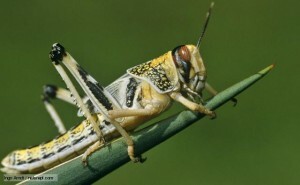 Though other insects can fly faster, the locust is a relatively easy animal to study considering it is larger in size. A study was done using the Schistocerca gregaria, desert locust, to understand insect flight performance. The desert locust has four-wings, but it is large and a persevering flyer which makes it a good candidate for the laboratory work. The aerodynamic forces exerted by the pairs of wings on each other were deemed negligible. When a locust flies, it extends its middle pair of legs and its hind legs backwards along its abdomen. Its antennae are stretched forward, and its front pair of legs is tucked up. Young et al. tracked the wingbeat of a desert locust using a high speed digital camera, and marking over one hundred natural features. This was used to reconstruct and analysis the deforming surface structure of the wings through computer simulations. The wings of desert locust are known to have a thickness of 0.05 mm, which was the value used when making the computer simulations. The grid was made in multiple parts. Aerodynamic forces were calculated by integrating viscous sheer stress and pressure on the body. This computational method was validated by comparing it to other methods of calculation. Two simplified models of wing kinematics were run. In one model, the instantaneous twist and angle of attack were maintained but the cambered chord was replaced with a straight line from the leading edge to the trailing edge. In this model, the wings undergo the same torsional strain as the real wings. In the second model, the torsional deformations were removed by replacing the real wing with a flat plane of the same area and same mid-wing angle of attack. In this model, the wing undergoes the same rotation from the base of the wing, but does not undergo any torsional deformation. The uncambered wings (first model) have less lift and thrust during the downstroke than shown by the fidelity model. The untwisted wings (second model) also require more power to generate aerodynamic forces than the fidelity model. The aerodynamic benefits of the actual locust wing were revealed by comparing the total power economy of the three computer models (uncambered, untwisted, and fidelity)., The total power economy is defined as the ratio of total force to total power, both force and power being time-averaged. The total power economies in the uncambered model (0.98 N W−1) and untwisted (0.84 N W−1) models are 7% and 15% lower, respectively, than the total power economy of the full-fidelity model (1.06 N W−1). The lower of efficiency of momentum transfer is due to the leading-edge separation that occurs on the hindwings in the simplified models and also to the resultant force having a different direction in the simplified models. The ratio of lift to power, both being time-averaged, is known as lift power economy. The lift power economy of the uncambered wings (0.78 N W−1) is 12% lower than that of the full-fidelity model (0.88 N W−1), whereas the lift power economy of the untwisted wings (0.51 N W−1) is 35% lower. This experiment concluded that wing deformation was necessary in locusts for maintaining the best direction for the aerodynamic force vectors and having efficient momentum transfer. The wing deformation in the hindwings helps to maintain an almost constant angle of attack during the downstroke which reduces flow separation that increases drag. Such aerodynamic elastic deformations in an engineered system have not yet matched the elegance and efficiency of the locust. 1. Young et al., Details of Insect Wing Design an Deformation Enhance Aerodynamic Function and Flight Efficiency Science Magazine (Vol. 325). September 2009.